Do I need a cohabitation agreement? You and your assets are always better protected if you have a cohabitation agreement. However, there are situations in which it is especially important to have a cohabitation agreement. 1. 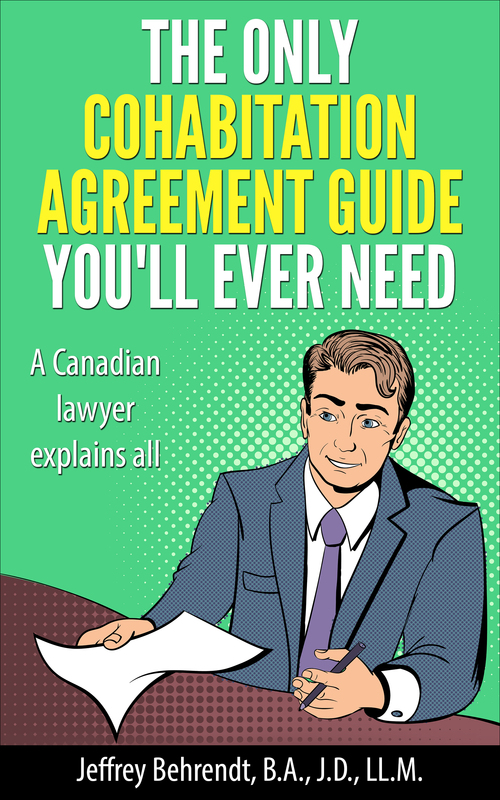 You cohabit in a province without a statutory regime for the division of property for common law partners. Ontario is such a province. In Ontario, there is no statute that governs the division of property. Instead, the basic rule is that each party keeps what is in his or her name. However, the longer the relationship, the greater the disparity in wealth between spouses, and the more marriage-like the relationship is, the more likely a court may intervene and find that one party has been unjustly enriched, and order a transfer of property. It can be very difficult, even for a lawyer, to predict whether an unjust enrichment claim will be successful. To prevent being in this grey area of law, you and your partner can enter into a cohabitation agreement. Then you can be certain as to how assets will be divided if your relationship ends. 2. You wish to divide your assets as a married couple would. A lot of people seem to think that property division for unmarried couples is the same as for married couples. Not at all! So, if you want your assets divided as if you were married, or at least in a similar way, you and your partner can set this out in a cohabitation agreement. 3. To deal with spousal support. After 3 years of living together, or one year if you have a child together, in Ontario the higher earning spouse will be responsible for paying spousal support as if the couple were married. Often people cohabit rather than marry because they want to avoid the legal regime that comes with marriage. However, that will not work with spousal support. If you want to change the spousal support rules that apply to you, then you and your partner will need to enter into a cohabitation agreement. 4. Estate Planning. Many people do not realize that in Ontario, for an estate law perspective, you and your partner are legal strangers. So, if your common law partner passes away without a will, then you will not inherit anything, regardless of how long you have lived together. Similarly, your common law partner can cut you out of their will. To avoid this sort of thing, particularly older couples will deal with estate planning in their cohabitation agreement. You can deal with minimum requirements that a will must contain, or allowing your partner to continue living in your home once you pass away, among other things. 5. You are financially stronger than your partner. If you are significantly wealthier than your partner, or earn significantly more money, a cohabitation agreement can protect your wealth and income. The greater the disparity between your and your partner’s financial situation, the more likely a court is to intervene if there is no cohabitation agreement. 6. To protect the dependent partner. One partner may interrupt their career for the other, such as to raise children, or to relocate to another part of the country. Or one partner may fall ill or get injured. A cohabitation agreement can be used to protect against some of these sorts of financial situations. 7. You’ve previously been married. When you’ve previously been married, your legal and financial concerns are often very different than in your first marriage. You may have children from a previous marriage, support obligations, and own a home or other significant assets. A cohabitation agreement can ensure that if you separate or you pass away, your assets are distributed according to your wishes, and that neither your first family, nor your new family, are cut off. 8. You own part of a business. Without a cohabitation agreement, when your relationship ends, your partner could end up owning a share of your business. Your business partners may not want this to happen. A cohabitation agreement can ensure that your spouse does not become an unwanted partner in your business. 9. Purchasing a home together. Typically, when couples purchase a home together, they are not in equal financial circumstances, and one party will contribute substantially more to the down payment and initial costs of the home. Without a cohabitation agreement, your home is likely to be shared as set out on the title to the home, which often states that the home is shared equally. So if you want to protect your initial deposit on the home, then it makes sense to enter into a cohabitation agreement. 10. To reduce stress. In the unhappy circumstance that your relationship ends, you will have the certainty of knowing precisely what will happen with regarding to the issues covered in your cohabitation agreement. Hey I’m a 25 year old male. That has just bought a home and also has a carrier in the oilfield. I’m single and I like to get a little more knowledgable on cohabitation agreements. I want to be smart about thing and keep my things that I have worked hard for. Got any advice. Marriage is overrated. I’ve watched to many guys lose there homes. @Josh – I would say half of all my cohabitation agreement clients are specifically interested in protecting their home. If you have any specific questions, please let me know and I’m happy to help. My fiancé had a cohabitation agreement typed up and in one of the paragraphs it says something like if we break up I (because I earn more) may have to pay him spousal support?? What is that all about. Is that what goes in a standard cohab agreement? Confused here. I haven’t taken it to my lawyer yet to sign because I don’t understand half of it! @Allison – Without a cohabitation agreement, after living together for 3 years, you would potentially have an obligation to provide spousal support. I have not seen what is written in your agreement, but likely it is just preserving your partner’s right to this. As for standard, there is no such thing as a “standard” cohabitation agreement. Each on is individually crafted for the couple. You should definitely take any cohabitation agreement to a lawyer for review. I’ve recently learned that a prenuptial agreement can be overturned for a variety of reasons: signing too quickly, under duress, all assets not fully disclosed etc., etc. Can a co-habitation agreement be overturned for any of those reasons? @Tony – Those aren’t just “reasons” – those are pretty fatal flaws. Pretty much any contract can be invalidated due to duress. Full financial disclosure is required for a cohabitation agreement. I’m not sure what you mean by signing too quickly, my hand can only move my pen so fast, perhaps under time pressure? In any event, as long as you and your partner both have lawyers, and both of your lawyers sign off on it, then your cohabitation agreement will likely be valid. Would a male and female who are just room mates require a cohabitation agreement? @Brad – only if they are in an continuous intimate relationship.